Here are more than two dozen ways to use Facebook ads to increase sales. Facebook is arguably the best platform for promoting your product, considering that you can reach 1.3 billion daily active users. There's only one caveat -- you need to know how to run a successful promotion campaign. 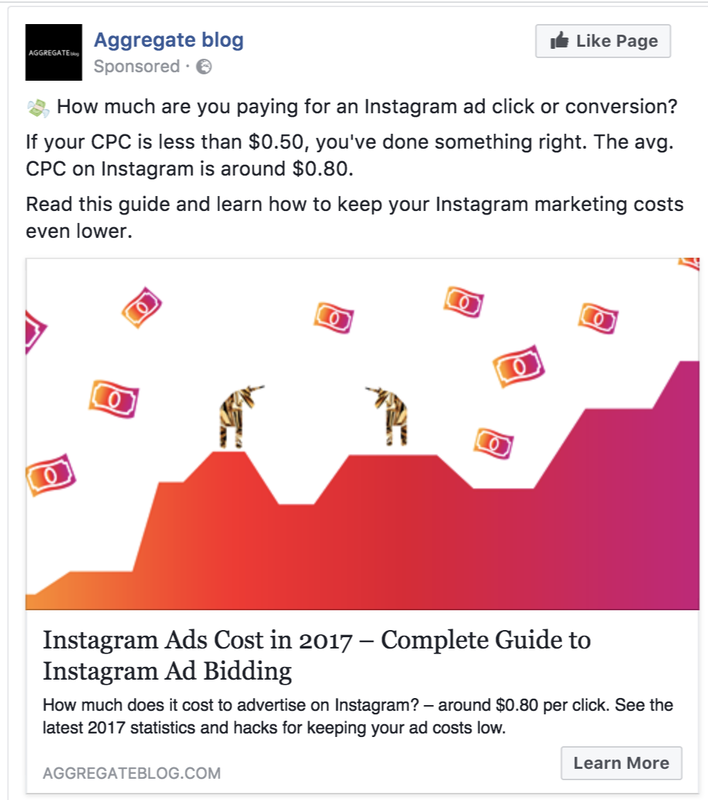 After managing 100-plus Facebook ad campaigns, I've learned that the cost-per-click can range anywhere between $0.10 to $4. What creates such a huge difference in campaign results? Your Facebook ad campaigns consist of many elements, including copy, design, target audience, bidding methods, etc. In this article, you're going to find inspiration for various Facebook promotions and see how to increase your product sales. 1. Find your Unique Selling Proposition. According to advertising legend David Ogilvy, writing a good advertisement starts by studying the product -- you need to know what makes it beneficial to its users and different from the competition. All your ads should promise the user a specific benefit: "Buy this product and you will get X" or "Buy this product and your life will improve in X way." Without a strong Unique Selling Proposition (USP), you'll be spending money on ad impressions but see little sales. 2. Focus on a single value proposition. When creating Facebook advertisements, brands tend to list all their product's benefits. That's not necessarily a good idea. According to one of the 20th century's most successful advertising agency executives, Rosser Reeves, a consumer tends to remember just one thing from an advertisement -- one strong claim, or one strong concept. Find a strong value proposition and make you ad's goal to communicate this single message efficiently. 3. Make your Facebook ad copy actionable. When writing copy for your Facebook promotions, use actionable language that nudges people into taking action. Use action verbs such as "get," "buy" and "try" to indicate the next step the ad viewer is supposed to take. Here's an example of ad copy we came up with for one of the campaigns I'm working on. 4. Include a customer testimonial. If your customers see that other people are happy with your product, it's a sign your product must be good. So, why not try to include a customer testimonial to your Facebook ad? Testimonials are from real people -- potential buyers can relate to them. Testimonials show your product in a good light. Testimonials help to create bigger trust in your brand and product. 5. Play on people's emotions. Based on a 2016 Nielson report, advertisements that generated above-average emotional response resulted in a 23 percent lift in sales volume compared to other ads. You can create Facebook promotions that inspire, scare or make people happy, depending on your goals. Paloma Vasquez, author of The Psychology of Social Shopping, has noted that: "Emotional states trump rational thinking; it's easier to sell to consumers when they are excited." 6. Create a sense of FOMO. Using the fear of missing out (FOMO) in advertising is a tried-and-proven strategy a that many brands frequently use to their advantage. Create a limited-time Facebook ad offer -- some people will feel bound to complete their purchase faster as they're afraid of missing out on the deal. Mention the number of users already benefitting from your product -- make the ad viewers users feel like they've need left our of a premium club. Let people know that the supply of your products is limited, e.g. only the first 100 first purchasers can get the product. 7. Include numbers in your ad copy. A study presented by Moz found that when given multiple options, 36 percent or respondents preferred a headline starting with a number, which was the highest percentage for any headline type. The same rule applies to Facebook ads -- people are naturally drawn to specific numbers. Show the amount or percentage of a discount. Mention the number of people already using your product. Disclose the price of your product. Giveaways and free trial periods are a great way to get new users to engage with your product for the first time. If they like your product during the free trial, people are more likely to continue buying it afterwards. You can also promote a giveaway where people can win something in return of sharing your Facebook post with their friends. I've seen many of those campaigns go nearly viral, especially if the brand is offering the chance to win something of high value. 9. Use the right call-to-action button. When setting up your Facebook ad campaign, you can select between 10 different call-to-actions. Which one should you choose? The best practice here is to pick the CTA that is closest to the action you want people to take. We once ran an experiment with a client to see which call-to-action performed best: "Learn More" or "Sign Up." While the "Learn More" CTA got more clicks at lower cost, the "Sign Up" CTA brought 14.5 percent more sales. That's why I always recommend marketers to select a more sales-oriented call-to-action. 10. Run a retargeting campaign. According to eMarketer, 30 percent of consumers show a positive reaction toward retargeted ads, while only 11 percent feel negative about remarketing campaigns. To set up a retargeting campaign on Facebook, you need to install the Facebook Pixel to your website and start tracking the visitors. 11. Offer retargeting audiences a small discount. If a website visitor didn't buy your product on their first visit, chances are that your product didn't match their expectations. On the other hand, it may also be that a person loved your product but considered it too expensive. That's why you could run a Facebook retargeting campaign that offers a slight discount and incentivizes people to return to your website. 12. Run an upsell campaign. According to a study conducted by Adobe, in the U.S., 41 percent of overall revenue is from repeat customers. If you're not remarketing to your existing customers, you're losing out on a huge sales opportunity. 13. Run a brand awareness campaign. The following is especially true for B2B ads: If the decision-maker is unfamiliar with your brand, they're unlikely to respond positively to any sales pitch. That's why, whenever you're entering a new market, start by running a brand awareness campaign -- so that people will know about your product as they would see it in a store. The most successful brand awareness campaigns I've seen combine the product images with a strong value proposition. 14. Amplify your PR with Facebook ads. Whenever your brand gets media coverage, share it on your Facebook page and set up a boosted post to help the article reach more people. Many brands add the "Featured In" snippet on their landing pages to show which media outlets have written about them. Sharing positive coverage about your brand on your Facebook page will have the same positive effect. Related: Want the Sale? Ask for It in Your Facebook Ads. 15. Create and promote an ebook. Gated content that requires people to share their email address in exchange for downloadable ebook or report has become highly popular. By promoting your ebooks with Facebook Lead ads, you can collect emails without people leaving Facebook's platform. 16. Run a holiday campaign. With Christmas around the corner, it's about time to roll out your holiday campaigns. Here's the thing: If you want to sell Christmas gifts via a Facebook promotion, start in early November. According to a study by the National Retail Federation, approximately 40 percent of holiday gift givers begin their holiday shopping before Halloween. 17. Make your product the hero of your ad. When thinking about what to add in the Facebook ad images, one of the best things to do is showcase your product. This has several benefits, from increasing brand awareness to giving people a closer look before they land on your website. This is especially relevant to brands selling consumer products available in brick and mortar stores. If people have first seen your product in a Facebook promotion, they will recognize it on the store shelves. 18. Use symbols to be memorable. People are quick to build new associations between things they see, and we're all naturally drawn toward symbols and stories. Experiments even show that character-driven stories with emotional content result in a better understanding of the key points a speaker wishes to make. That's why you can benefit from adding symbols to your ad copy (in the form of emojis) or in the ad image, e.g. in the form of a growth chart. Here's a Facebook post example I used to share one of my blog articles. 19. Create high-contrast Facebook ad images. 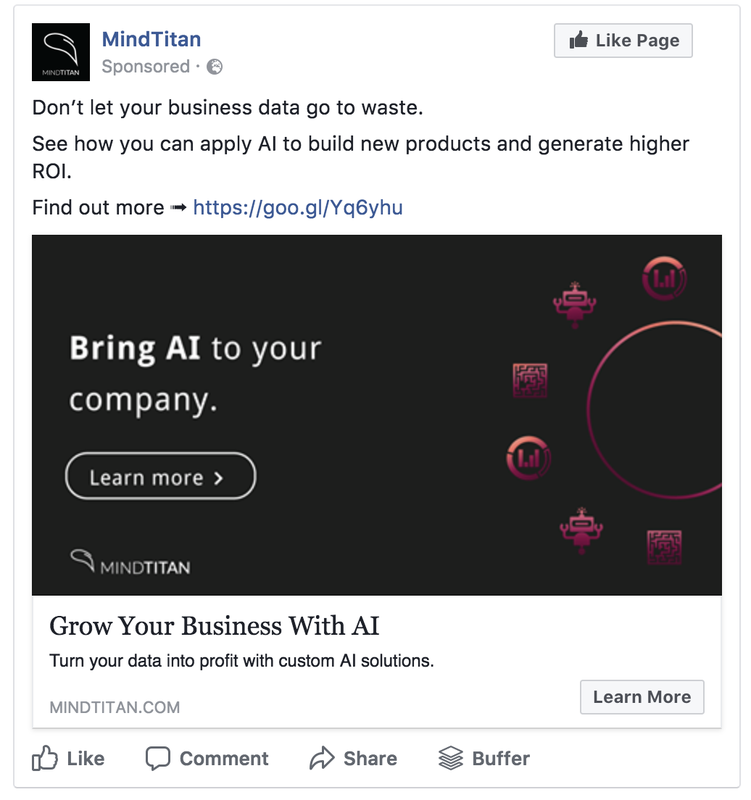 Whenever I work with a brand on its Facebook ads and run an A/B test of multiple ad images, 95 percent of the times the high-contrast images win. 20. Add your USP to your ad image. The surefire way to make most people notice your ads' key message (Unique Value Proposition) is to include it in the image. Consumer Acquisition found that images are responsible for 75 percent to 90 percent of ad performance -- that's what people notice first. 21. Tell stories with carousel ads. By using the Facebook carousel ad format, you can include up to 10 images or videos in a single advertisement. You could either use this opportunity to showcase multiple products, list benefits or tell the story of your brand. A report by Kinetic Social shows that carousel ads are as much as 10 times more efficient at getting people to click compared to regular Facebook ads. While carousel ads won't always bring you a 1000 percent percent increase in ad engagement, introducing some variation to your campaign is a good way to catch more different people's attention. 22. Give a try to video ads. All Facebook ad placements (News feeds, Instagram, Audience Network) support video ads. In my experience, video ads have a slightly higher cost-per-click than regular ads, but they also help to get the attention of those audience members you haven't attracted with static ads. Make sure that the first five seconds of your video catches people's attention. Always add captions as the videos often play without sound. Include a call-to-action at the end of your video ad, to indicate the next step. Another tactic to successfully promote your product on Facebook is to segment your target audience by location. This way, you can create location-specific copy and ad designs that are relevant to a particular city or country. 24. Set up A/B tests. It's hard to tell which one of your advertising ideas works best unless you test all of them. You can easily split test different ad copies or visuals by setting up a Facebook ads experiment. Don't try to test everything at once -- test a single ad element per campaign, be it the headline, ad image or target audience. Test highly different variations -- make sure your tested elements aren't too similar for the difference to make any meaningful impact. Make sure your experiments are statistically valid -- you need at least 100 conversions per variation to get usable insights. 25. Use the Dynamic Creatives feature. Facebook recently added the Dynamic Creatives feature that lets you add different copies and ad images into a single ad. As you publish the campaign, Facebook's algorithms will start looking for the best option. To see the results of your Dynamic Creatives experiment, go to the Facebook Ads Manager and break down your campaigns by creative assets. 26. Target advanced Facebook audiences. If you're new to Facebook advertising, the easiest way to create a target audience is to select a location and reach people based on their interests. That's not a bad way to target people, but you can get even better results with advanced Lookalike audiences. A Lookalike audience is a Facebook audience that includes people similar to your existing customers. You can create a Lookalike audience by first uploading your customer data into a Custom Audience and then creating a Lookalike based on that audience. As a result, you can reach people who are more likely to purchase your product as they have similar interests and demographics than your current user base. 27. Run a campaign with a custom ad schedule. Your Facebook promotions aren't relevant to your audience 24/7. By using the Facebook Ads Manager, you can uncover the weekdays and time of day that brought you the best ROI. Next, you can set up a custom ad schedule on the Ad Set level, so that Facebook will only show your ads at specific times of the day. 28. Run an Instagram campaign. When setting up your Facebook ad campaigns, you can edit the placements of your ads. This gives you the option to set up an Instagram ad campaign. When setting up an Instagram-only campaign, you can better measure the results by advertising platform and reach people while they're browsing their friends' images. As people mainly use Instagram to keep up with their friends and favourite brands, advertising on this platform works best for consumer-facing brands and may bring lower results for B2B advertisers. Always consider your target audience and where they hang out when selecting the placements for your Facebook promotions. Related Video: Not Getting Results With Your Facebook Ads? Here is Everything You Are Doing Wrong.